Welcome to "Open Woodworking Center". After 50 years of working in woodwork and carpentry, Yeshaya Gur decided to devote himself to his real passion: wooden artwork and teaching other people in creating wood products. His workshop is located in northern Israel, Kiriat Bialik, between Haifa and Acre. In his workshop he teaches youngsters and adults how to use manual, mechanical and power tools to create products made from a wide selection of wood. Mr. Gur also designs, manufactures and sells handmade wooden artwork, mainly connected to Jewish and Israeli tradition. The company also imports and sells a wide range of tools and machinery. This page is primarily dedicated to visitors living outside of Israel. Tourists visiting here may contact me on my cellular phone (+972)052-6706085. We apologize to our English speaking visitors living in Israel that we did not translate all of the web-pages into English, as they are probably not relevant to people living abroad. If you need information about services from other pages, please send me an e-mail. Here below is a list of artwork products available for sale. Indicated end-user single-unit prices are in US$ and Euro, Israeli VAT free for export, not including shipment. Shipping price is determined according to weight and includes the cost of insurance, handling and packaging labor and packing materials. Orders of more than one unit are subject to a quantity discount. We are interested in finding agents and art galleries in your country. Please send us an e-mail message. The products are hand carved from Olive, Maple, Mahogany, Walnut and Ash wood. Mezuzah - (Hebrew, "doorpost"). Small parchment of Torah verses placed on the doorpost of Jewish homes. Chanukiah - Nine-branch candlestick used on Hanukkah. 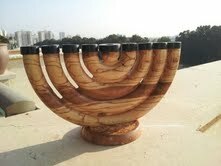 Menorah candlesticks - (Hebrew,"candelabrum"). A seven-branch candlestick. Part of the furnishings of the tabernacle in the wilderness and the Temple in Jerusalem. In 1948 it became the official symbol of the State of Israel. 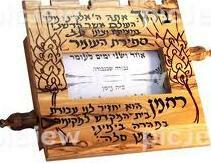 Havdalah spice box - The havdalah (separation) spices are kept in a special container called a besamim box or hadas. Dimensions: 45 cm long; 13cm wide; height about 10cm.